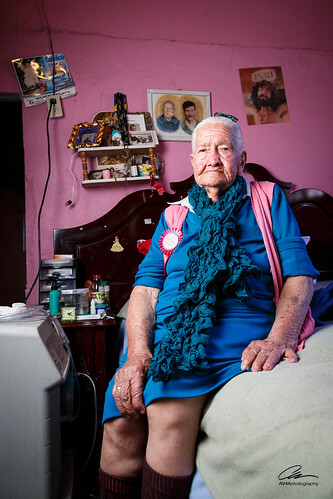 Over the weekend we took a trip to Tijuana Mexico to see Veronica’s Grandmother for her 84th birthday party. Since it was a special day, I took the opportunity to have her pose for a quick photograph. With such a caring and loving heart, she was surrounded on this day, not only by her family, but by so many other people that she cared for since they were children. When their lives were filled with fear and violence, she would provide shelter. When their lives were filled with darkness, she would bring them light. She was the hope for the children that needed it most. And yet after all these years of sheltering and caring for others, she still continues. Feliz Cumpleaños Abuelita. Lighting: Canon 580EXII camera left inside medium softbox gelled with 1/4 CTO set at 1/32 power, triggered by Pocket Wizard PWIIs. Window light to the right acting as fill.